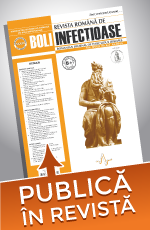 The Romanian National Society of Infectious Diseases offers Society’s Prize – for the authors who published the best scientific articles throughout the year. The prize represents the acknowledgement of merits in scientific literature and contributes at rising the score of the professional CV. More details about the editorial publishing process and terms of sending the articles are presented in extenso at „Standards – Instructions for authors”. As well, the members of The Peer-Review Council will be mentioned permanently on the official site, in the fourth number of the publication and will receive an official Peer Reviewer Certificate. 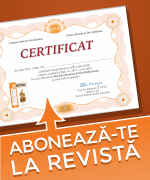 This certificate contributes at rising the score of the professional CV.